Recently I was given the opportunity to play test an upcoming new game that will be available on Kickstarter very soon. I received a prototype copy of the game and rules. These are my thoughts and opinions on the presented materials. Enjoy! 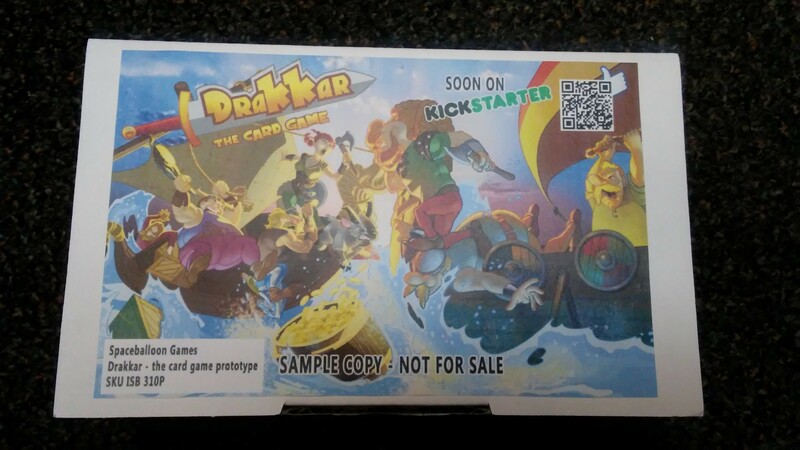 Drakkar: The Card Game is a game by The Irregulars, published by Spaceballoon Games. It is for 3-5 players. In this game, players take on the role of village leader of a mighty Viking clan. That will be trying to prove they are the strongest Viking on the island over the course of 3 months, but to do this they’ll have to pillage and plunder several different resources to do this. They’ll also need to build a Drakkar or Viking ship, filling it with warriors and beer as they set sail to take on quests and collect loot. In the end, the player that can prove they’re the mightiest of all the Vikings by collecting the most victory points will be declared the winner. To begin, all cards are specially marked for the number of players. The corresponding quest cards are separated from the regular cards. The cards that are not to be used are returned to the box. The quest cards are then shuffled together and placed face down on the table. Each player is then dealt a quest card, face down. The other stack of cards are set aside for the moment. The loot tokens are divided into 3 separate stacks and placed close to the quest cards. Each player is given 1 goat loot token. The first player is chosen and is given the Viking meeple. They are now known as the “Earl”. Play now begins. The game is played over 3 months or rounds. Each round consists of 3 phases; the brawl, play cards, the quest. The first phase is the Brawl phase. In this phase, the Earl player shuffles the regular cards and then divides them into stacks equal to the number of players. Players should be able to watch as the Earl creates each stack. The stacks are placed in the center of the table away from each other. Players now place one hand behind their back and the other with the elbow on the table with the index finger up. Once everyone is ready, the Earl will shout, “By ODIN!” At this time, players will quickly try to place their index finger on one of the stacks of cards. The first player to touch a stack takes it. If more than 1 player aim for the same stack, the slower player(s) must quickly choose another free stack. Once each player has a stack of cards, play moves to the next phase. The second phase is the play cards phase. In this phase, players can now look at their hand of cards from the stack that they just chose. They will then choose one of the cards to play. They will place it in middle of the table, covering it with their hand. Whatever side they place face up will be the one chosen. Once everyone has played a card, each player now reveals their chosen card. Cards are then resolved by priority, beginning with the red cards, followed by the yellow and then blue ones. Red cards allow a player to take a token from another player or steal another player’s yellow card that they just revealed. Yellow cards are equipment cards. These are placed in front of the player. Ships require 2 or 3 cards to complete. Each ship card can hold only 1 card. Vikings and beer are placed on top of a ship card. It should be noted that in this phase, players can swap and move cards onto and off of their ship. However if they remove a card from their ship to place another one onto it, the removed card is discarded. A player must have free ship cards before they can store a card, but they don’t have to have a complete ship to store cards. Blue cards allow a player to attack other players to gain loot tokens or to destroy a part of another player’s boat. This is repeated until all 10 of a player’s cards have been played. The last phase is the quest phase. In this phase, players check to see if they are able to fulfill the requirements of their quest. 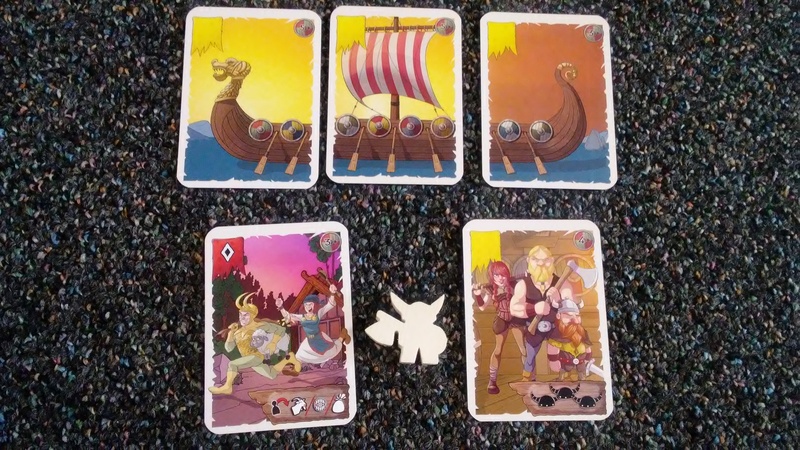 If the player was able to build a complete ship and they have enough vikings and beer to complete a quest, they can collect the loot shown on their quest card. If their ship is complete but they don’t have the vikings or beer required, they can ask for help from another player that didn’t have the ship parts to complete their ship. Using the other players vikings and/or beer, players can team up to fulfill the quest and then divide the loot. If the player wasn’t able to complete their ship, they are forced to sell off their vikings and beer. The player turns their quest card over to show the “Team Up” side. The players vikings and beers are then able to be used by other players. Once the quest phase is over, all of the regular cards are shuffled together and placed back in the middle of the table. A new quest card is dealt face down to each player. A new round begins, unless it’s the end of the third round. The game continues until the end of the third round. Once this happens, players calculate their final score. They earn 1 point for each loot token, with an additional 3 points for each set of 3 different tokens they collected. Players compare scores and the one with the most points is the winner. Since this is a prototype copy, I won’t go into a lot of detail about the quality of components. What I will tell you is that the artwork on the cards and loot tokens is really fun and cartoon like. The Loki card is especially funny and makes me laugh out loud. The first player token is a little wooden viking meeple that looks pretty darn cool. The iconography isn’t hard to understand at all. It’s all pretty simple stuff. The one thing that I hope is that in the finished product, the loot tokens will all be wooden and screen printed. For me that would just be great. For such a simple card game, what I’ve seen looks really great. There’s really not a lot of pieces to the game so it should be a fairly small boxed game. The prototype looks good. I think that the finished product will look even better. I feel like the designers are headed in the right direction. This should end up being quite nice overall. Just like the components, the rulebook is also a prototype copy. What came with the game was a couple of sheets of paper stapled together and then folded to fit inside the box. There are several colored pictures and a couple of examples in the rules. The different phases of the game are covered in great detail. There’s also a list of all the different cards with explanations of how each one works. Reading through the rules I couldn’t find anything that was difficult to understand. For a prototype, I think that everything was covered pretty well. All that’s needed is to have some finishing touches and a material upgrade and it should all be just right. I’m happy with the look at this point. This is a simple and fast playing little card game that even the kids can play. It’s mainly about fulfilling those quests to collect loot. Of course, your quest is dictated by the luck of the draw. I kind of would like if you were given a couple of quests instead of just the one, that way you could decide which quest you wanted to go for. That way you could diversify your loot tokens to be able to capitalize more on the bonus for having 1 of all 3 types of loot. Other than that though, the game is fast and fun. There’s a mild bit of take that and plenty of player interaction with the red and blue cards. In a lot of ways, this game kind of reminds me of Vikings Gone Wild mixed with Munchkin. I think if you’re a fan of either of these games, then you’ll most likely enjoy this one too. There’s a mild bit of strategy, in the fact that you not only have to think about which card you want to use, but also which side of the card. That gives you 20 different options at the beginning of the round. I have to say, I like this one so far. I’m sure as time goes on, with revisions to the rules and improvements to the components, the game will just get better. This should be one that the whole family can enjoy. I recommend checking this one out. Drakkar: The Card Game is a fast and fun card game with a viking theme. The game doesn’t last very long. Most game sessions last around 20 minutes or so. The prototype copy that I received looks really good. I like where everything is headed but am hoping for some wooden loot tokens. Of course if they were screen printed, that would be even better. The artwork on everything looks great. I especially like the different cards. The Loki card absolutely owns me. The rulebook is also headed in a good direction. Everything is easy to read and understand. The game itself is simple and family friendly. This is a game that even the kids can enjoy. That makes this game a win in my book. Overall it’s fun and one that I would recommend checking out. I look forward to seeing the finished product. For more information about this and other great games, please check out SpaceBalloon Games at their site. Keep a look out for the Kickstarter campaign page, coming soon. This entry was posted in Preview Reviews and tagged balloon, board, board games, card card games, drakkar, games, irregulars, space, spaceballoon, spaceballoon games, vikings. Bookmark the permalink.